Easily, my favorite holiday – Halloween is just too much fun & we're big into Halloween around here! 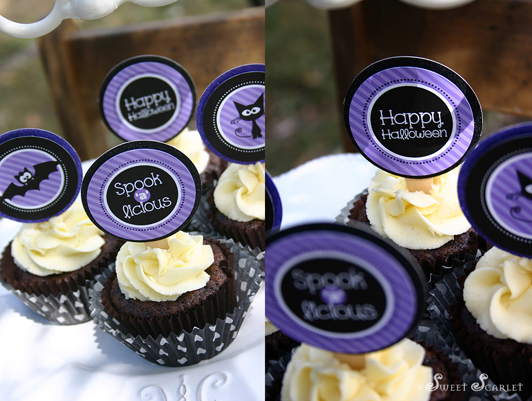 My kids helped me with these yummy Halloween treats I put together for my new Halloween Party Printable Set – "Spook-a-licious"! It's purple, it's fun & it's yum! 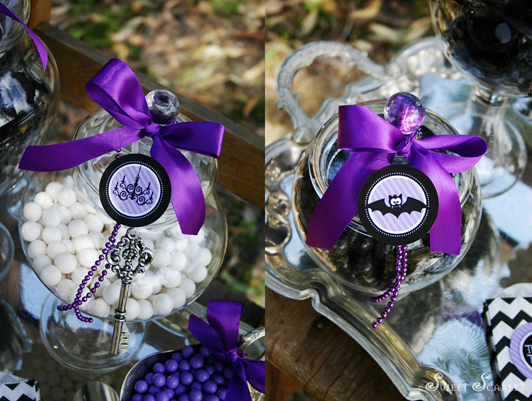 Black Cats, Bats and delicious details really caught my imagination with this set. 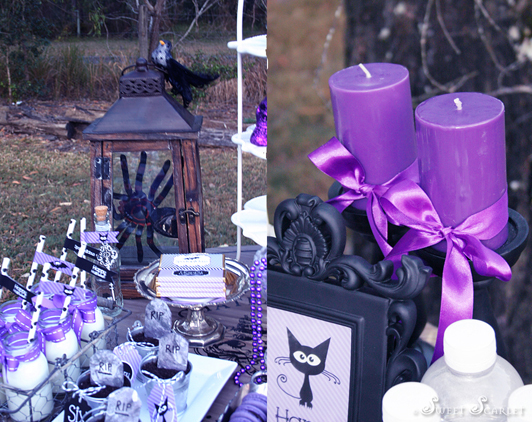 And, this table was fun to style because I got to use some of my vintage silverware for a spooky, gothic-feel. 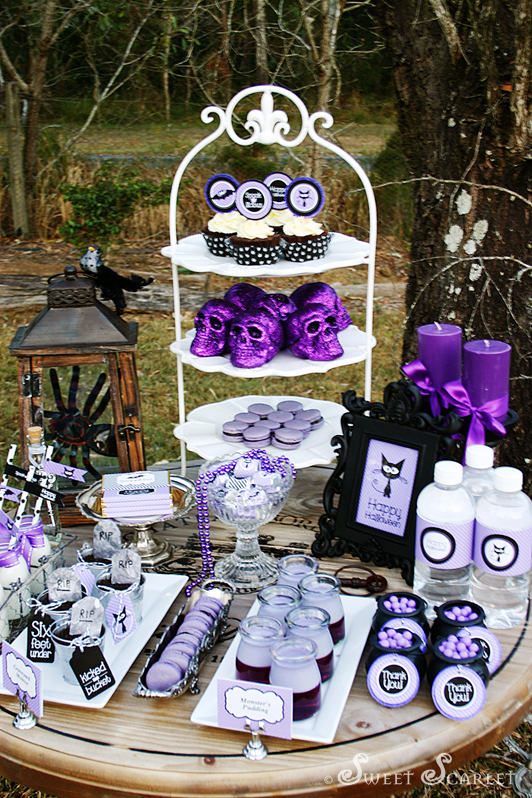 Treats include Graveyard Mousse, Monsters Pudding, Halloween Macarons & Mini Cauldrons full of Candy! Because that's what Halloween is all about. This printable set includes 2" Cupcake Toppers, Water Bottle Labels, Editable Food Tents, Fun Favor Swing Tags, "Thank You" Favor Tags, Candy Bar Wrappers, Cupcake Wraps, 4" Fold-over Bag Toppers, a "Happy Halloween" Bunting, 6"x4" Party Signs & Straw Flags. All for $10. 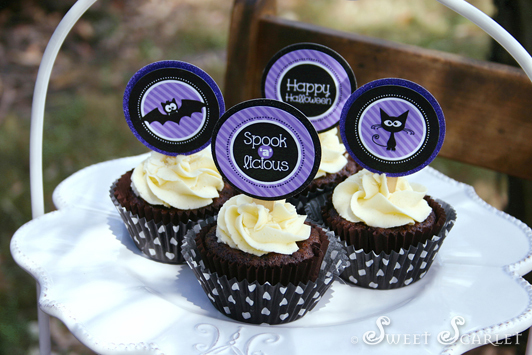 Just PRINT, TRIM & CREATE your own "Spook-a-licious" Halloween Dessert Table. Printables files are available for purchase in my Etsy shop. 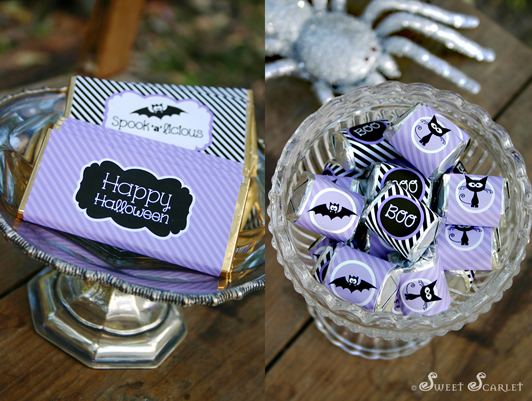 I hope you enjoy this fun and frightful Halloween Printable design. 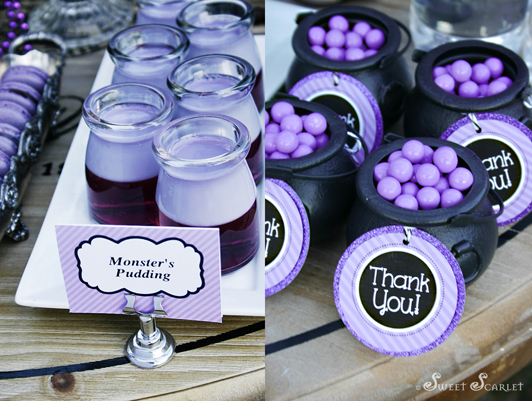 (colored using Wilton Violet Gel, which matches the printables perfectly). Recipe for White Jell-O is here. 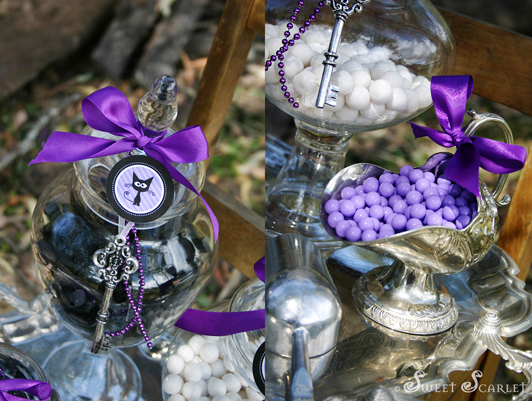 Plus, 2" "Thank You" Favor Tags on mini black cauldrons filled with purple sixlets. You can buy these sixlets online here. 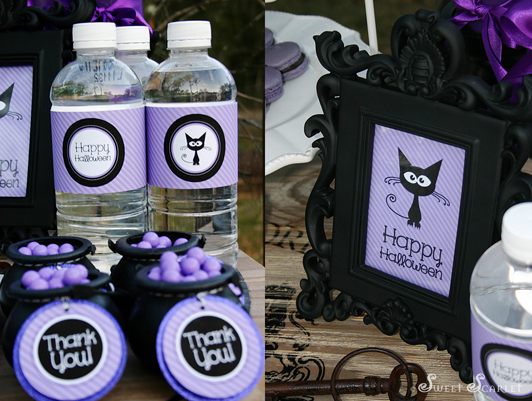 Water Bottle Wrap Labels and one of the 6" x4" Printable Party Sign Designs from the set. 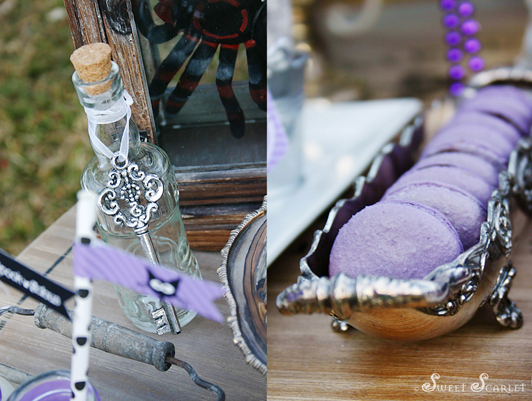 I used some vintage pieces for the styling of the table. These Halloween Macarons were yum! The Macaron recipe I use (and swear by) is here. Printable Mini Wrappers for Hershey's Nuggets. 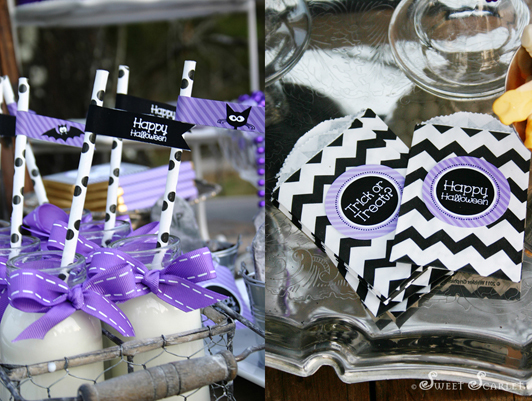 Printable Swing Tags add some fun to these treats! Check out the "Graveyard Mousse", which is chocolate mousse served in individual mini tins, covered in crumbed Oreo "dirt" and topped with a fondant tombstone. The cellophane Treat Tubes are available here. 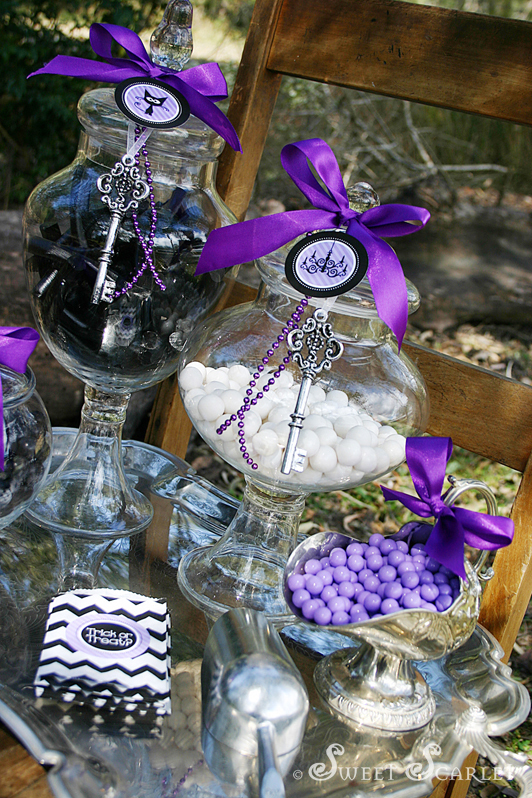 Dressing-up your Candy Jars with Printable Party Dots and ribbon can make your table 'pop'. 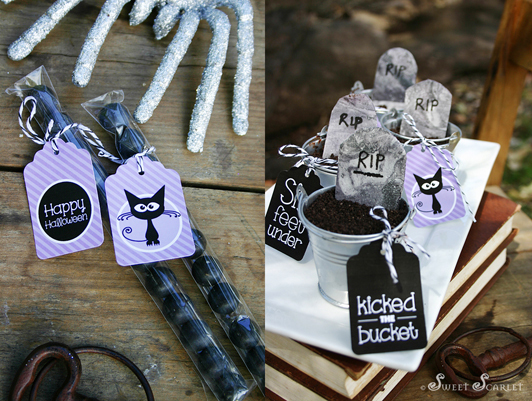 I hope you like this Halloween Printable Set as much as I do. Just $10 in my Etsy shop here. Gorgeous! Love the colour combo and the way you've styled everything looks amazing. Stunning, you have some serious talent Elise..
love that fleur de lis pie stand! where did you get it? Nicole, I got the plate stand at a little shop here in Brisbane, Australia, sorry, I don't remember the name. great taste of creativity. I love you new discovery on color to Halloween, it is perfect.